Da Georg Friedrich Händel (laut Taufregista: Georg Friederich Händel, anglisiad: George Frideric Handel; * 23. Febajul./ 5. Meazgreg. z Halle (Saale); † 14. Aprui 1759 z London) wor a deitscha Komponist im Barock. Ea guit ois oana vo de bedeidnstn Komponistn vo oin Zeidn. Da Händel hod in Deitschland und Italien Musi studiad und hod se anno 1712 z London niedaglossn. 1727 is a britischa Stootsbiaga worn. Ea hod in England scho zu Lebzeidn ois Klassika goitn. Anno 1738 is fia eam z London in Vauxhall Gardens a lemsgrouß' Denkmoi baut worn. Des is a Listn vo de Kompositiona vom Händel. 03_13 Florindo 1708-00-001708 Theater am Gänsemarkt, Hamburg HinschHinrich Hinsch Nua Fragmendt san dahoidn. 08_18a/b/c Il pastor fido 1712-11-2222 Novemba 1712 Queen's Theatre, London RossiGiacomo Rossi, after Giovanni Battista Guarini The 1712 version is 8a. The 1734 revised versions are designated 8c. The prologue Terpsicore added to the final version is 8b. 23_2A2 Genserico (or Olibrio) 0000-00-00 BereganAfter N. Beregan Drafted early 1728. Only part of Act I. Music mostly used in Siroe and Tolomeo. 28_2A5 Titus l'Empereur 0000-00-00 RacineAfter J. Racine: Bérénice Only one act (first three scenes) with some music used in Ezio. Composed late 1731. 32_2A11 Oreste 1734-12-1818 Dezemba 1734 Covent Garden Theatre, London BarlocciAdapted from G.G. Barlocci Pasticcio, composed in 1734. Music entirely by Handel. Overture published in HG volume 48 (p. 102). 39_2A13 Alessandro Severo 1738-02-2525 Feba 1738 King’s Theatre, London ZenoAdapted from Zeno Pasticcio, composed in 1738. Music entirely by Handel. Overture published in HG volume 48 (page 104). 40_2A14 Giove in Argo 1739-05-011 Mai 1739 King’s Theatre, London LucchiniAdapted from A.M. Lucchini Pasticcio, composed in April 1739. Music entirely by Handel. Semi-staged. 43 The Alchemist 1710-01-1414 Jenna 1710 Queen's Theatre, London Instrumental music for the revival of Ben Jonson's play The Alchemist. An arrangement, by an anonymous composer, of music from Handel's opera Rodrigo. 44 Comus 1745-06-00June 1745 Ludlow Castle, Shropshire Three songs and a trio written as part of a private arrangement of John Milton's masque Comus. 45 Alceste 1750-00-00Not performed A masque which was written for an unproduced play by Tobias Smollett. Music composed between December 1749 and January 1750. 50a Esther 1718-00-00?1718 probably Cannons John Arbuthnot IMSLP. Based on Alexander Pope's work. Originally a masque. 55 L'Allegro, il Penseroso ed il Moderato 1740-02-2727 February 1740 Theatre in Lincoln's Inn Fields, London Charles Jennens Stanford. Based on John Milton's work. 89 Cecilia, volgi un sguardo 1736-01-00London, January 1736 1736-02-2519 or 25 (?) February 1736 Covent Garden Theatre, London Played between the two parts of Alexander's Feast (HWV 75). 96 Clori, Tirsi e Fileno or Cor fedele in vano speri 1707-09-00Rome, July/September 1707 0000-00-00 Copied for Ruspoli, 14 October 1707. 97 Crudel tiranno Amor 1721-06-00London, June 1721 1721-07-05Probably 5 July 1721 King's Theatre, Haymarket, London Performed at the benefit concert for Margherita Durastanti. 100 Da sete ardente afflitto 1709-00-00Italy, 1708–09 0000-00-00 Copied for Ruspoli, 1709. (HWV 101a & 101b: Dal fatale momento. Spurious, by F. Mancini). 104 Del bell'idolo mio 1709-00-00Rome, 1707–09 0000-00-00 Copied for Ruspoli in 1709, but possibly written as early as 1707. 105 Armida abbandonata or Dietro l'orme fuggaci 1707-06-00Rome, June 1707 1707-26-26Possibly 26 June 1707 Palazzo Bonelli, Rome Copied for Ruspoli, 1707, 1709. 108 Dolce mio ben, s'io taccio 0000-00-00 0000-00-00 No autograph. No source attributed to Handel. 119 Echeggiate, festeggiate, numi eterni or Io languisco fra le gioie 1712-00-00London, circa 1710–12 0000-00-00 Partly lost. Fragments printed in wrong order in HG. 120a Irene, idolo mio 1709-00-00Italy, 1707–09 0000-00-00 No autographs or Italian-period copies. 120b Irene, idolo mio 1710-00-00England, after 1710 0000-00-00 No autographs or Italian-period copies. 124 Look down, harmonious saint 1736-00-00circa 1736 1736-00-00February 1736 Covent Garden Theatre, London Recitative and aria; probably a discarded fragment for "Alexander's Feast" (HWV 75), 1736. It appeared in the cantata HWV 89 Libretto by Newburgh Hamilton, from Cecilian Ode 1720. 125a Lungi da me, pensier tiranno 1708-07-00Italy, July – September 1708 0000-00-00 1st version; no autographs or Italian-period copies; one version copied for Francesco Ruspoli, 1708. 125b Lungi da me, pensier tiranno 1710-00-00London, after 1710 0000-00-00 Second version; no autographs. 132a Mi palpita il cor 1710-00-00?London, after 1710 0000-00-00 Borrowings: Version of "Dimmi, o mio cor" (HWV 106) with new opening. 135b Nel dolce tempo 1710-00-00London, after 1710 0000-00-00 No autographs, and no early Italian-period copies. 137 Nella stagion che di viole e rose 1707-05-00Rome, April/May 1707 0000-00-00 Copied for Ruspoli, 1707, 1709. Probably composed for the soprano, Margherita Durastanti. 147 Partì, l'idolo mio 1710-00-00London, after 1710 0000-00-00 No autograph or eary Italian copies. 150 Ero e Leandro or Qual ti riveggio, oh Dio 1707-00-00Rome, 1707 0000-00-00 Derived from the story of Hero and Leander Libretto ?Cardinal Pietro Ottoboni. 154 Quel fior che all'alba ride 1740-00-00London, circa 1738–40 0000-00-00 Published in Handel (ed. Burrows), "Songs and Cantatas for Soprano." 155 Sans y penser 1707-09-00Rome, September 1707 0000-00-00 Composed in Italy. Copied for Ruspoli, 1707, 1709. 157 Sarei troppo felice 1707-09-00Rome, September 1707 0000-00-00 Copied for Ruspoli, 1707, 1708 (incomplete) Libretto by B. Pamphili. 158a Se pari è la tua fè 1708-00-00Rome, 1708 0000-00-00 Copied for Ruspoli, 1708, 1709. 166 Splenda l'alba in oriente 1712-00-00London, circa 1711–12 0000-00-00 Survives only in fragmentary form. 178 A mirarvi io son intento 1711-00-00?Hanover, circa 1711 First movement reappeared 2 years later in the Utrecht Jubilate (HWV 279) as "Be ye sure that Lord he is God.". Slow middle section formed the basis for the final chorus of "Alcina" (HWV 34) in 1735. 181 Beato in ver chi pùo 1742-10-31London, 31 October 1742 Italian version of Horace, "Beatus ille"
183 Caro autor di mia doglia 1712-00-00Hanover, circa 1710–12 Spurious, by Reinhard Keiser. 194 Sono liete, fortunate 1711-00-00?Hanover, circa 1710–11 The final movement was later used in the overture to "Judas Maccabeus" (HWV 63). 195 Spero indarno 1740-00-00London, circa 1730–40 Single movement, known only from copies. Authenticity uncertain. 196 Tacete, ohimè, tacete 1709-00-00Italy, circa 1707–09 Libretto by Francesco de Lemene (1692) which appears under the title "Amor dorme" in his "Poesie Diverse." 200 Quel fior che all'alba ride 1709-00-00?Italy, circa 1707–09 Two versions, slightly different texts. 202 Künft'ger Zeiten eitler Kummer Soprano 1726-00-00London, circa 1724–26 by B.H. Brockes from "Irdisches Vergnügen in Gott." 203 Das zitternde Glänzen der spielenden Wellen Soprano 1726-00-00London, circa 1724–26 by B.H. Brockes from "Irdisches Vergnügen in Gott." 204 Süsser Blumen Ambraflocken Soprano 1726-00-00London, circa 1724–26 by B.H. Brockes from "Irdisches Vergnügen in Gott." 205 Süsse Stille, sanfte Quelle ruhiger Gelassenheit Soprano 1726-00-00London, circa 1724–26 by B.H. Brockes from "Irdisches Vergnügen in Gott." 206 Singe, Seele, Gott zum Preise Soprano 1726-00-00London, circa 1724–26 by B.H. Brockes from "Irdisches Vergnügen in Gott." 207 Meine Seele hört im Sehen Soprano 1726-00-00London, circa 1724–26 by B.H. Brockes from "Irdisches Vergnügen in Gott." 208 Die ihr aus dunkeln Grüften Soprano 1726-00-00London, circa 1724–26 by B.H. Brockes from "Irdisches Vergnügen in Gott." 209 In den angenehmen Büschen Soprano 1726-00-00London, circa 1724–26 by B.H. Brockes from "Irdisches Vergnügen in Gott." 210 Flammende Rose, Zierde der Erden Soprano 1726-00-00London, circa 1724–26 by B.H. Brockes from "Irdisches Vergnügen in Gott." 230 Ah! che troppo ineguali or O del ciel! Maria regina Soprano 1708-00-00?Rome 1707–08 Recitative and aria. 234 Il pianto di Maria or Giunta l'ora fatal Soprano 0000-00-00 Spurious. Misattributed to Handel; composed by Giovanni Battista Ferrandini (1710–91). 235 Antiphon Haec est Regina virginum Soprano G major 1707-00-00?Rome, 1707 1707-07-16?15/16 July 1707 Rome Probably written for services held at the church of S. Maria di Monte Santo to celebrate the feast day of "Madonna del Carmine". 241 Antiphon Salve Regina Soprano G minor 1707-00-00?Rome, 1707 1707-06-19?19 June 1707 Vignanello Probably first performed on Trinity Sunday at Francesco Ruspoli's private chapel. 243 Antiphon Te decus virgineum Alto G minor 1707-00-00Rome, 1707 1707-07-16?15/16 July 1707 Rome Probably written for services held at the church of S. Maria di Monte Santo to celebrate the feast day of "Our Lady of Mount Carmel". 244 Cantata Kyrie eleison Chorus 0000-00-00 0000-00-00 Misattributed to Handel; by A. Lotti ("Missa Sapientiae"), but copied by Handel circa 1749. 245 Cantata Gloria in excelsis deo Chorus 0000-00-00 0000-00-00 Misattributed to Handel; by A. Lotti ("Missa Sapientiae"), but copied by Handel circa 1749. 269 Amen...alleluja Soprano, Bass D minor 1746-00-001735-46 0000-00-00 Probably intended as a vocal study. 270 Amen Soprano, Bass F major 1746-00-001735-46 0000-00-00 Probably intended as a vocal study. 271 Amen...alleluja Soprano, Bass G minor 1746-00-001735-46 0000-00-00 Probably intended as a vocal study. 272 Alleluja...amen Soprano, Bass D minor 1746-00-001735-46 0000-00-00 Probably intended as a vocal study. 273 Alleluja...amen Soprano, Bass G major 1746-00-001735-46 0000-00-00 Probably intended as a vocal study. 274 Alleluja...amen Soprano, Bass A minor 1746-00-001735-46 0000-00-00 Probably intended as a vocal study. 276 Amen...hallelujah Soprano, Bass F major 1747-00-001744-47 0000-00-00 Probably intended as a vocal study. 277 Hallelujah...amen Soprano, Bass F major 1747-00-001744-47 0000-00-00 Probably intended as a vocal study. 246 O be joyful in the Lord 1718-00-00Cannons, 1717–18 0000-00-00 St. Lawrence, Whitchurch, London Chandos Anthem No. 1 or Jubilate ('Cannons') in D major. Also considered a Canticle. Psalm 100 (the Jubilate). 247 In the Lord put I my trust 1718-00-00Cannons, 1717–18 0000-00-00 St. Lawrence, Whitchurch, London Chandos Anthem No. 2. Transcribed for orchestra by Edward Elgar in 1923 as the Overture in D minor, and by Stokowski in 1924 Psalm 9, 11, 12, & 13 from Tate and Brady's New Version of the Psalms of David. 248 Have mercy upon me 1718-00-00Cannons, 1717–18 0000-00-00 St. Lawrence, Whitchurch, London Chandos Anthem No. 3. Psalm 51 (the Miserere). 249b O come, let us sing unto the Lord 1718-00-00Cannons, 1717–18 0000-00-00 St. Lawrence, Whitchurch, London Chandos Anthem No. 4. Partly based on "O sing unto the Lord a new song" (HWV 249a). The overture was later reused in Handel's oboe concerto No. 2. "Prayer Book" version of Psalms 93 & 96. 254 O praise the Lord with one consent 1718-00-00Cannons, 1717–18 0000-00-00 St. Lawrence, Whitchurch, London Chandos Anthem No. 9. Psalms 117, 135, 148 in metrical versions of Nahum Tate and Nicolas Brady's "New Version of the Psalms" (1696). 257 O praise the Lord, ye angels of his 0000-00-00 0000-00-00 Spurious. Misattributed to Handel in Arnold's edition and in HG 36. By Maurice Greene, before 1728. 258 Zadok the Priest 1727-10-11?9 September 1727 – 11 October 1727 1727-10-1111 October 1727 Westminster Abbey Coronation Anthem No. 1. For the Coronation of King George II and Queen Caroline. Performed at the Anointing. English version of antiphon "Unxerunt Salomonem Sadoc sacerdos," after I Kings 1, 39–48. 259 Let Thy Hand Be Strengthened 1727-10-11?9 September 1727 – 11 October 1727 1727-10-1111 October 1727 Westminster Abbey Coronation Anthem No. 2. For the Coronation of King George II and Queen Caroline. Sung at the Recognition (the King being presented to the people). Psalm 89: 13–14. 261 My Heart is Inditing 1727-10-11?9 September 1727 – 11 October 1727 1727-10-1111 October 1727 Westminster Abbey Coronation Anthem No. 4. For the Coronation of King George II and Queen Caroline. Performed during the coronation of the Queen. After Psalm 45: 1, 10, 12 and Isaiah 49:23. 264 The ways of Zion do mourn or Funeral Anthem for Queen Caroline 1737-12-125(?) – 12 December 1737 1737-12-1717 December 1737 King Henry VII's Chapel, Westminster Abbey Probably first performed fully choral without solo movements. The Sinfonia was not performed at the funeral and was probably added later. From Lamentations, Samuel, Job, Ecclesiasticus, Philippians, Wisdom, and Psalms 103, 112. 267 (?) First draft of the "Peace Anthem" (See HWV 266) 1749-00-00Probably early 1749 0000-00-00 A 209-measure composition of which the last 19 measures are incomplete. ?c.1704–05 0000-00-00 1863-00-001863 "Oboe concerto No. 3"
293 Organ F major 0000-00-00 1735-03-26?26 March 1735 London, Covent Garden Theatre 1738-00-001738 Opus 4 No. 5 Performed with revival of "Deborah" (HWV 51). 295 Organ F major 1739-04-022 April 1739 1739-04-044 April 1739 London, King's Theatre, Haymarket 1740-00-001740 "2nd Set" No. 1 Referred to as Organ Concerto "No. 13". The bird-song motives of the 2nd movement earned the concerto the nickname, "The Cuckoo and the Nightingale"
296a Organ A major 1739-00-001739 1739-03-2020 March 1739 London, King's Theatre, Haymarket 1740-00-001740 "2nd Set" No. 2 Referred to as organ concerto "No. 14"
297 Organ D minor 0000-00-00 0000-00-00 1740-00-001740 "2nd Set" No. 3 Referred to as organ concerto "No. 15". Arranged from Concerto Grosso Op.6 No.10 (HWV 328). 298 Organ G major 0000-00-00 0000-00-00 1740-00-001740 "2nd Set" No. 4 Referred to as organ concerto "No. 16". Arranged from Concerto Grosso Op.6 No.1 (HWV 319). 299 Organ D major 0000-00-00 0000-00-00 1740-00-001740 "2nd Set" No. 5 Referred to as organ concerto "No. 17". Arranged from Concerto Grosso Op.6 No.5 (HWV 323). 300 Organ G minor 0000-00-00 0000-00-00 1740-00-001740 "2nd Set" No. 6 Referred to as organ concerto "No. 18". Arranged from Concerto Grosso in G minor Op.6 No.6 (HWV 324). 301 Oboe B-flat major 0000-00-00 0000-00-00 1740-00-001740 "Oboe concerto No. 1"
302a Oboe B-flat major 0000-00-00 0000-00-00 1740-00-001740 "Oboe concerto No. 2"
304 Organ D minor 1746-00-00circa 1746 1746-02-14?14 February 1746 1797-00-001797 Sometimes referred to as organ concerto "No. 15". First performed with the premiere of The Occasional Oratorio (HWV 62). 305 Organ F major 1748-00-00circa 1747–48 0000-00-00 0000-00-00 Sometimes referred to as organ concerto "No. 16". Arranged by Handel from the Concerto a due cori in F major (HWV 334) (3 movements) and Marche in F.
310 Organ G minor 1750-01-3131 January 1750 1750-03-1616 March 1750 London, Covent Garden Theatre 1761-00-001761 Opus 7 No. 5 Performed with "Theodora" (HWV 68). Final gavotte in published version probably added later by Smith Jr.
329 A major 1739-10-3030 October 1739 0000-00-00 1740-00-001740 Opus 6 No. 11 A reworking of the Organ Concerto in A major, HWV 296. 335a D major 1746-00-00circa 1746 0000-00-00 0000-00-00 Version of the overture to the Fireworks music. 335b F major 1746-00-00circa 1746 0000-00-00 0000-00-00 Version of the overture to the Fireworks music. 337 Overture D major 1725-00-00circa 1722–1725 0000-00-00 0000-00-00 Probably intended as an introductory movement. Possibly intended to be coupled with the concerto grosso in D major Op. 3 No. 6 (HWV 317) as the adagio movement. 358 Unspecified G major 1710-00-00circa 1707–10 0000-00-00 A "Fitzwilliam" sonata. The autographed manuscript, located in the Fitzwilliam Museum, does not mention instrumentation, nor are there tempo markings for the movements. It is tentatively assigned to the violin in the HHA, however the recorder is also a possibility. 359b Flute E minor 1724-00-00circa 1724 1732-00-001732 01bOpus 1 No. 1b Of the two sonatas published by Chrysander as Opus 1 Sonata I, this one (Sonata Ib) is the one in Walsh's original edition (where it is called Sonata I). 361 Violin A major 1726-00-00circa 1725–26 1732-00-001732 03Opus 1 No. 3 The only violin sonata to have been published exactly as written by Handel. 364a Violin G minor 172200-00circa 1722–24 1732-00-001732 06Opus 1 No. 6 Both Walsh and Chrysander published the work as an oboe sonata. 364b Viola da gamba G minor 1724-00-00circa 1724 0000-00-00 A transcription of HWV 364a—as suggested by Handel on the manuscript. 367a Recorder D minor 1726-00-00circa 1712 0000-00-00 09aOpus 1 No. 9a Movements 1–5 constitute the "Fitzwilliam Sonata III" in Thurston Dart's arrangement. Originally published Flute Sonata in B minor, Op 1 No 9b (HWV 367b). The contemporary edition of Handel attributes it to the transverse flute, but the autograph manuscript is clearly for the recorder. 379 Flute E minor 1728-00-00circa 1727–28 1879-00-001879 01aOpus 1 No. 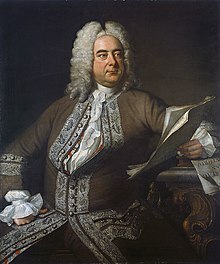 1a The work's authenticity is unquestioned, but the sonata is not part of Handel's Opus 1 as published by Walsh—having been added by Chrysander. 408 Violin C minor 1729-00-00circa 1725–29 0000-00-00 Allegro. It may be the only surviving fragment of a completed sonata in C minor. Used as the finale to the Recorder sonata in A minor (HWV 362). 419-1 1720-00-00circa 1710–20 0000-00-00 HWV 419 1-6 are six marches. They are known only from printed sources; were published as separate treble and bass parts; with instrumentation unspecified, though title pages mention flute and violin for treble parts. May have originated as a keyboard work. 434 Suite de pièce Vol. 2 No. 1 B-flat major 1717-00-00?1710–1717 1733 434-4: minuet in G minor which is also used in the flute sonata in E minor (HWV 375). Not part of the Suite de piece in B-flat major. 434-3 has the theme used by Johannes Brahms for his Handel Variations. 456-1 Arrangement 1727-00-00circa 1720–1727 Arrangement of the overture to the Italian opera “Il pastor fido"
456-2 Arrangement 1727-00-00circa 1720–1727 Arrangement of the overture to the Italian opera "Amadigi"
456-3 Arrangement 1727-00-00circa 1720–1727 Arrangement of the overture to the Italian opera "Flavio"
456-4 Arrangement 1727-00-00circa 1720–1727 Arrangement of the overture to the Italian opera "Rodelinda"
456-5 Arrangement 1727-00-00circa 1720–1727 Arrangement of the overture to the Italian opera "Riccardo Primo"
598 to 604 Seven pieces C major 1740-00-00circa 1730–1740 Clock-Organ. HWV 600 (a version of HWV 588) named "A Voluntary for a Flight of Angels." Handel's music was arranged by other composers. The arrangements included pasticcio, adaptations, and the inclusion of the work of other composers. Aria The Beauteous Cloe or 'Cloe, you're witty' 0000-00-00 0000-00-00 A recycling of the aria 'S'io dir potessi' from Ottone (HWV 15), possibly by Handel himself. Latin sacred cantata Gloria 1709-00-00?1703–1709 2001-06-033 June 2001 The International Händel Göttingen Festival For soprano, two-part violins, basso continuo. Identified in the year 2001 at the Royal Academy of Music's library (London). The manuscript is not in Handel's hand. ↑ "British Citizen by Act of Parliament: George Frideric Handel". Parliament.uk. 14 Aprui 2009. http://www.parliament.uk/business/publications/parliamentary-archives/archives-highlights/handel-and-naturalisation/. Retrieved on 13 Aprui 2012. ↑ 4,0 4,1 Anthony Hicks. "Handel, George Frideric", The New Grove Dictionary of Music and Musicians, ed. S. Sadie and J. Tyrrell (London: Macmillan, 2001), x, 783. ↑ Anthony Hicks. "Handel, George Frideric", The New Grove Dictionary of Music and Musicians, ed. S. Sadie and J. Tyrrell (London: Macmillan, 2001), x, 786. ↑ Anthony Hicks. "Handel, George Frideric", The New Grove Dictionary of Music and Musicians, ed. S. Sadie and J. Tyrrell (London: Macmillan, 2001), x, 787. Homepage der Händel-Gesellschaft Karlsruhe e.V. De Seitn is zletzt am 25. Juni 2018 um 13:13 gändert worn.